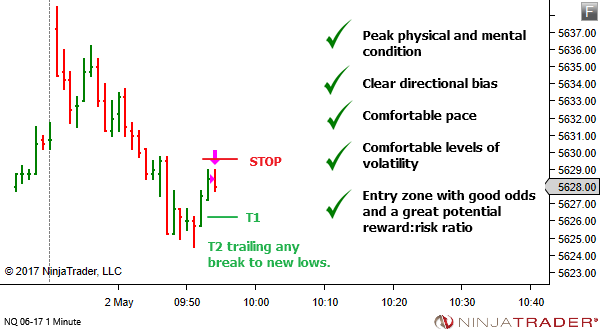 The whole analysis process for a novice trader is aimed towards finding a winning trade. 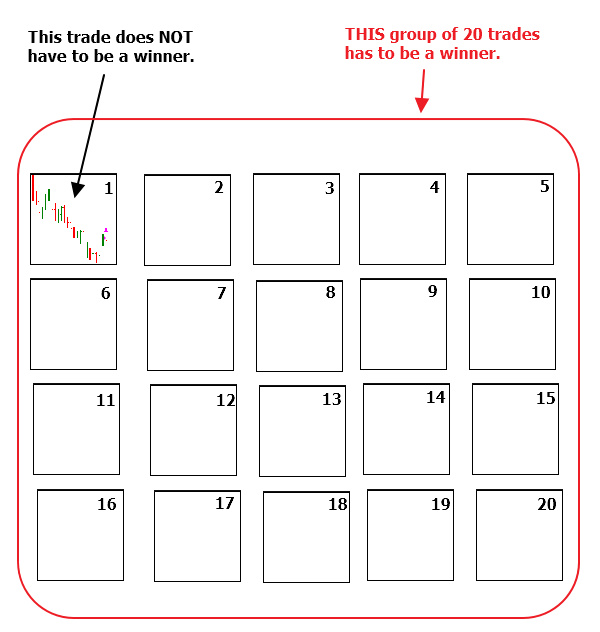 Sure, they know intellectually that not all trades will win. But surely this one… the one they worked so hard for… the one that all their analysis says is a good trade… it's just got to win! Gripped by the fear that comes with every tick of price movement, they increase the risk of mismanaging the trade. They increase the likelihood of underperforming. And they risk potential damage to their self-belief. What if you had a different mindset? 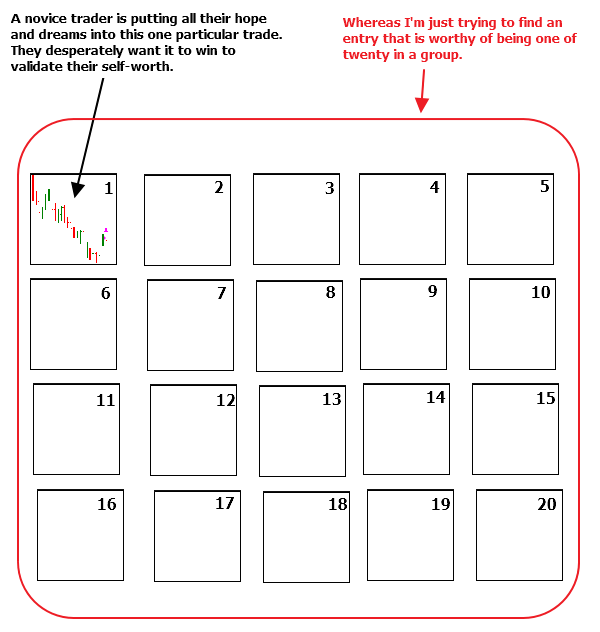 A novice is trying to find a trade that will win. I'm trying to find an entry that is worthy of being one of twenty. This is an entry that is worthy of being one of 20 within the group. It doesn't need to be a winner. The whole group of 20 needs to win. 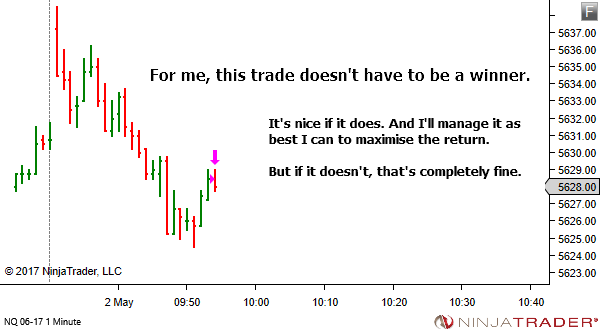 So this trade just needs to get me off to a good start – profiting if it can, and just minimising the damage if it can't. A slightly different mindset…. but with a whole lot less fear. Thanks Mohamed. I’m pleased you liked this one. 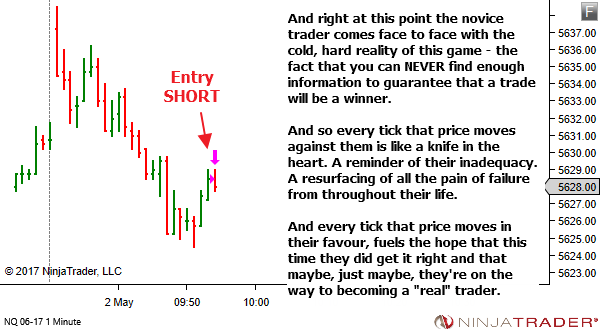 “And so every tick that price moves against them is like a knife in the heart. A reminder of their inadequacy. A resurfacing of all the pain of failure from throughout their life. I find EXACTLY myself on this quotation. I can not thank you enough for all these valuable sharings. Thank you Mr Lance. There is a reason these quotations seem to describe your situation so well. It seems that it’s just part of the journey.